Towards the front of the group photo provided to FishbowlNY, there are people like Business Insider sports editor Leah Goldman, tech reporter Alyson Shontell, video production head Justin Maiman and deputy lifestyle editor Julie Zeveloff. 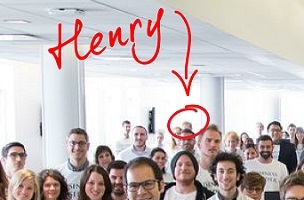 And at the very back, as diagrammed, there is almost imperceptibly company founder Henry Blodget. Trump New Media, this ain’t. 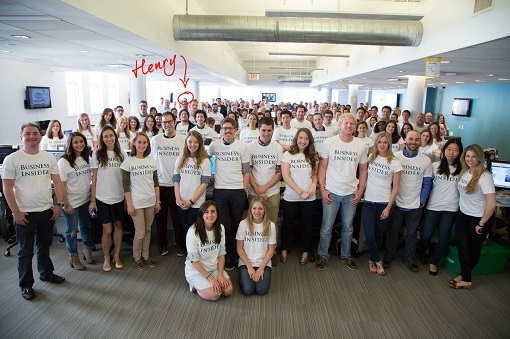 The photo was taken at the brand new newsroom headquarters of BI at 150 Fifth. The building is a few blocks south of Madison Square Park and includes a spectacular roof deck. The move overlaps with the recent news of Jezz Bezos’ latest investment in BI. The company now has 160 full-time staffers, vs. 100 a year ago. The new office space, at 21,000 square feet, is essentially twice as large as the old one (12,500 square feet). Larger version of group shot here.